Long before the advent of Facebook, EarthCorps planted the seeds of a global network of environmental professionals in the US and abroad. More than twenty years later, EarthCorps is pushing new boundaries by innovating ecological practice, evolving how people learn leadership, and engaging diverse communities in hands-on action. 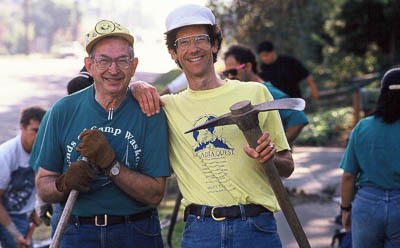 Founder Dwight Wilson (right) with a member of the 1930’s Civilian Conservation Corps. The CCC was an inspiration for EarthCorps. How can we build a more peaceful, verdant world? The original answer was a Peace Corps for the Earth – an Earth Corps. Young environmentalists from many different countries could come together to plant trees, exchange perspectives, learn through service, and return home to implement projects and share what they learned. Dwight Wilson dreamed up this idea while working as a Peace Corps volunteer in Chile and Honduras. In 1993, he and several friends tried it out in an experimental program called Cascadia Quest. This effort grew into a year-round intensive program for promising young leaders. Our corps program was born. In the early 2000s, Seattle’s large urban forests teetered on the brink of destruction by invasive weeds. EarthCorps stepped up with a new solution. Proclaiming 2003 as the year to get “Ivy Free,” EarthCorps mobilized hundreds of corporate volunteers, students, and concerned citizens to save the city’s magnificent old-growth forest in Seward Park. The effort sparked cooperation with the City of Seattle and Cascade Land Conservancy (now Forterra), to create the Green Seattle Partnership, one of the largest urban re-greening efforts in history and a model for other cities. There are now more than nine “Green Cities” working to preserve and manage their urban forests. Helping people take hands-on action to care for nature is at the heart of how EarthCorps operates. We are deeply grateful to the 175,000 volunteers who have pitched in so far to save urban parks and forests! 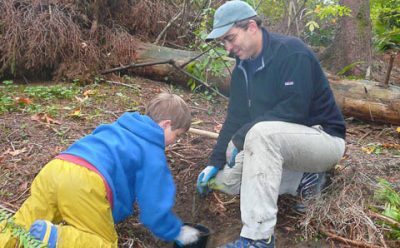 Executive Director Steve Dubiel plants with his son at an EarthCorps volunteer event. EarthCorps plays an important role in restoring Puget Sound, a national priority. In 2011, Friends of the Hylebos Watershed passed the torch to EarthCorps to drive stewardship along Hylebos Creek, a salmon-bearing stream that drains into the Sound. The next year, People For Puget Sound entrusted their near-shore restoration sites, blue carbon research, and Puget Sound Steward program to our care. Cities and conservation districts partner with EarthCorps to provide green infrastructure to reduce stormwater pollution into Puget Sound. In 2014 in an historic agreement, EarthCorps was selected to provide long-term stewardship for 17 key sites along Commencement Bay. We promise to keep these former SuperFund sites safe for key wildlife like salmon and sea birds, for hundreds of years. We hope to see many more success stories like this soon in the Puget Sound and around the world.